A New domestic table tennis season gets under way tomorrow evening with some big changes at the top. Division One has had an over-haul and, after two seasons with a two-man team format, it will revert to the tried and tested three-man team structure. In addition to this, the clubs have this year tried their best to select evenly matched teams in an attempt to create a high-quality and, more importantly, competitive league. 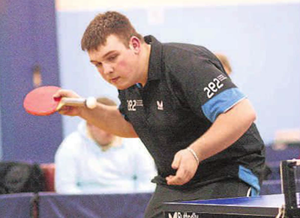 Lions have three of the five First Division teams and the A team is made up of five-time CI men's singles champion Garry Dodd, along with Liam Robilliard (pictured) and Chloe Le Tissier. The latter is one of three players making the big step-up from Division Two where the 16-year-old enjoyed a fruitful season, winning two out of every three singles matches that she competed in.